After you successfully shot. your next shot will receive more points. The less shots there are. The more points you get for each shot. Floor ball brings 10 additional points. Wall ball multiplies your points by 3. For a swish you get an additional ball. For 3 swishes you get a big basket for three shots. For five successive scores you get all dots for 3 shots. For 10 successive scores - 50 dots for three shots. You should turn your wifi off before you launch the Doodle Basketball 2 app. 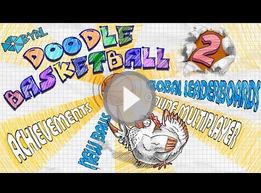 In-case you already open the Doodle Basketball 2 app, just force close or use the multitask button and swipe it out.